Assam, an East Indian state with valleys and hills has some unique culture and tradition. This north-eastern state of India situated near the mighty river Brahmaputra is home to diverse ethnic groups and cultures. Assamese’s love for life is vividly reflected in their dance and music. Not just this musical genre communicates the delight, distress, fun and frolic of Assam, it conveys to the general population of North East. In recent times, some of the famous artistes have rationalize the music industry. Some of the songs have a greater influence when it comes to celebrating festivals. We have come up with a top list of new Assamese video song. So, let’s have a look. A beautiful romantic track sung by Zubeen Garg & Satabdi from blockbuster hit film ‘Mission China’. Mero Mayaalai song is picturised on Yankee Parashar and Siddhartha Nipon Goswami. You can watch this video on YouTube under the banner “Times Music”. To watch this video in full HD just click on the link below. This latest Assamese song is from the album Pancham (2017). Majuli is sung and composed by Nilutpal Bora and lyrics are penned by Santanu Rowmuria. This melody is a modest endeavor to remain with the general population of Majuli who have never let the expectation down and to say that ‘the bright rising sun will reach us soon’. Kahinir dore song is from the Assamese movie “Konwar puror konwar” released on 6th January 2017. Sung by Nayan Nilim and Pompi Gogoi. The lyrics of the song are written by Ibson lal Baruah and music is composed by Poran Borkatoky (jojo). The song was published on March 24th 2017 on YouTube under the banner “Sony DADC Assamese”. This list would not be complete without mentioning a traditional Bihu song of Assam. A classical song sung by Gyandevi and Mayadevi & lyrics given by Gyanjyuti and Niron. This tune was published on 24th October 2017 under the banner “Assamese Culture”. The song “Deepor Bilote” sung by Rakesh Riyaan and Ailitta Kashyap which also features actor Utpal Das in it. This song is loved by people of all ages and has all the magical flavors that you want in an Assamese song. This song is close to 2 million views and has already received over 3.8k likes on YouTube. Now you can browse, search and explore all your Assamese hit video songs on Snaptube. Besides songs, you can watch movies, sports, dramas as well. 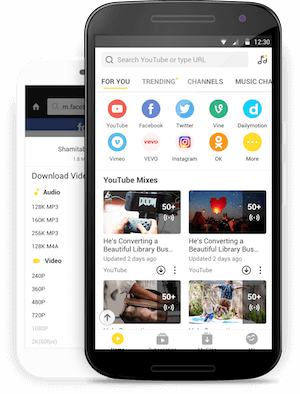 The app comes pre-configured with over a dozen different streaming websites like YouTube, Instagram, Facebook, Twitter, Videoming, Dailymotion and many more. It has picture in picture mode which makes it possible to browse and stream movies simultaneously. Videos are available in multiple resolutions from small size of 360p to high-definition of 4k. So, what are you waiting for? Get this app on your Android device for free and have a unique experience. Tejimola is about a girl who was tortured and beaten to death by her stepmother. This song tells us about the girl in different forms. One of the latest video songs in this list was published in the year 12th October 2017.Sung by Joi Barua & produced by Smitakshi B. Goswami. This video of Assamese song is available on YouTube under the banner “Pratidin Time”. Next on the list is popular Assamese singers Zubeen Garg & Nahid Afrin. Their hold over popular culture and imagination in Assam goes beyond anything that public relations, image building or marketing can achieve. This video was published on 2nd November 2017 and so far, it has been viewed well over 2 million times & received over 11k likes on YouTube. Assamese song videos surely touch every age people in a way which nothing else can do. This incredible song from Neel Akash is quite impressive which you will like. Music given by Ujjwal Aarong & directed by Deepak Dey. Watch this video on YouTube right now. This is one of Anurag Chaudhury & Chayanika Bhuyan latest Assamese album video song and it is as good as any of their previous tracks. Video was published on 28th December 2017 under the banner “Musical Assam”. Album name is “Anuragor Gaan”. This video has already received 4.5 k likes and over 1 million views on YouTube in just 3 months tells about the popularity of this video. ‘URI URI JAI’ is a latest Assamese video song composed by Dikshu Sharma added with some desi style in between. Deeplina Deka acted and sung in this exclusive video song. Bijiyeta Patgiri penned the lyrics and Bibhuti Gogoi is the music producer. It got published on 10th April 2017 on YouTube under the banner “Deeplina Deka”. Add this song in your playlist right now.